There are always those who see opportunity in chaos. 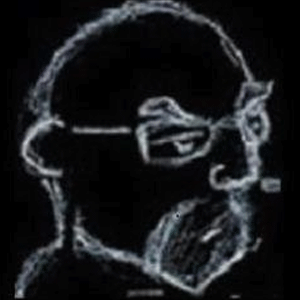 The destruction of the old order leaves gaps that need filling, and “men of vision” see nobody better than themselves to fill those gaps. This does require a certain moral flexibility, of course. A willingness to leave behind your old beliefs and embrace new ones even more fervently. There were many such men who rose and fell during the French Revolution, but few were as blatant or as successful as Joseph Fouché. Fouché was born in the tiny village of Le Pellerin in western France in 1759. His father Julien Joseph Fouché was a slave trader who operated out of the nearby port city of Nantes. 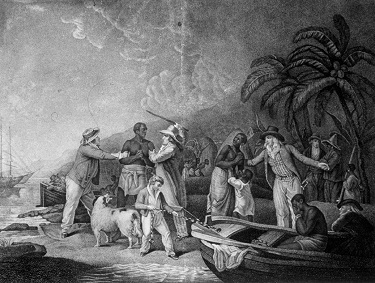 Fouché senior operated the “triangle trade”, a lucrative practice where slaves were bought in Africa, shipped to America where they were sold and luxury goods like sugar were bought with the profits. Those were then taken back to Europe where they were sold, and then the ship would load up with trade goods and head down to Africa to repeat the process. This made enough money that Fouché senior was able to buy a slave plantation in Santa Domingo, which gave the family a steady source of income when he died suddenly in 1771. The cruel slave trade where the Fouche family fortune was made. Young Joseph Fouché originally hoped to become a trader like his father, but his ill health made that a poor choice. Instead then he became a scholar, studying in Nantes. Like most education at the time, this was provided by the church; in this case an order known as the Oratorians (more formally, the Oratory of Jesus and Mary Immaculate). Their schools were notable at the time as being deliberately more “modern” than those of the Jesuits, for example. The Oratorians taught in French, not Latin, and their pupils learned European languages in use at the time rather than ancient classical ones. They embraced the philosophy of the Enlightenment, and taught their pupils to do the same. Fouché showed an aptitude for teaching, and he was sent to Paris for further studies. 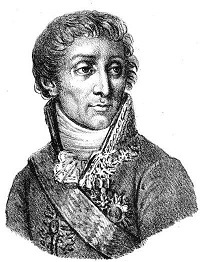 At the age of 23 he was made a science teacher, and then held several teaching posts around the west of France over the next five or six years. He became a Freemason during this time, and also made the acquaintance of a lawyer and academic in the city of Arras named Maximilien Robespierre. They bonded over their shared belief in the need for urgent political reform, as the corruption of the nobility and the problem of social inequality was driving France towards an abyss. And then in 1789 a mob stormed the Bastille prison in Paris, and the dive into that abyss began. 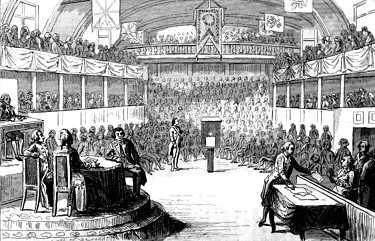 The trial of King Louis XVI in front of the National Assembly. Due to Fouché’s enthusiastic support of the Revolution, he was moved back to Nantes where the Oratorians hoped the could keep him in check. He wasn’t held back from political involvement though, and became a member of the Jacobin Club. This was effectively a political party (though the idea of political parties had not yet infected western democracy). It held anti-Royalist and anti-clerical views, which Fouché enthusiastically spoke out about. The population of Nantes loved it. The clerical organisation he was a member of were less sure. They were right to be worried. In the summer of 1792, the monarchy were overthrown and a new democratic assembly was elected. One of the first acts of the French Assembly was to officially dissolve all church organisations within France, including the Oratorians. Since Fouché had never taken any major vows, he was easily able to leave the church when that happened. This was convenient, as he happened to be a member of that very assembly which had just dissolved them. He had stood for election and had won, and so he was now the deputy for the department of Loire-Inférieure. His academic career was over, but his political career had just begun. Fouché’s previous experience made him a natural fit for the Committee of Public Education, and initially he aligned himself with the Girondin faction of the Jacobins. They were the more dominant faction in the party, so it made sense. Their drive to spread the gospel of the Revolution to other countries also fitted into his own beliefs. However he left them over the same issue that led to them losing their control over the party – the fate of the captive King Louis XVI. The Girondins had initially opposed overthrowing the king, as they favoured a constitutional monarchy over a republic. After Louis was found guilty by the assembly of treason, they led the call for clemency and that he be imprisoned for life. Fouché believed that the king must die, and so he joined the Montagnard faction in calling for his execution. It was a well-timed switch of allegiances. By the end of the year, the Girondin leadership would suffer the same fate as the king: death at the hands of Madame Guillotine. War with the rest of Europe had become almost an inevitability, and the death of Louis XVI ensured it. Fouché’s speeches calling for the king’s execution made him infamous abroad, which in turn helped to elevate him within France. While war was being fought on the borders, he was given the task of suppressing internal dissent. Sparked by the regicide, a revolt had broken out in the provinces of La Vendée and Brittany, and he was sent out as a Représentant en mission to deal with the problem. A representative-on-mission had almost dictatorial powers of life and death. While military forces crushed the rebel armies, Fouché used those powers to execute anyone suspected of harboring rebel sympathies. It was brutal, but it was also efficient. To the movers and shakers of the Republic, Fouché became known as a man willing to do whatever it took to get a job done. In the autumn of 1793, the man who had taught for a Christian order became one of the leaders of the drive to de-Christianize France. The Republic had initially tolerated Christianity, but their refusal to indulge ancient privileges had led to the Catholic Church finding itself in constant opposition to them. In addition, the rhetoric of the Revolution meant that any failures of the Republic must be due to enemies within it rather than incompetence on the part of its leadership, and Christians made a good choice for those enemies. 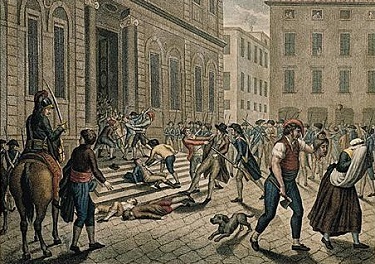 While the Reign of Terror that baptised the Revolution in blood is most often associated with the guillotines of Paris, in fact the majority of its victims came from the executions carried out in the rebellious provinces. One of the most infamous centres of that Terror was Lyon. In August of 1793 it revolted against the Republic. Two months later it was conquered, and the Committee for Public Safety sent two Representatives to make sure it didn’t rebel again. Fouché and his fellow representative-on-mission, Jean-Marie Collot d’Herbois, formed what they called the “Temporary Commission for Republican Supervision”. They began with a ceremony of Reason to dedicate their “holy mission”, and then they started killing anyone suspected of reactionary sympathies. 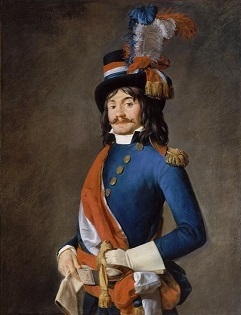 Fouché had decided that the guillotine was both too slow and lacked sufficient horror, so he came up with a new method that earned him the nickname of the “Musketeer of Lyon”. Those sentenced to death were chained together into groups of a dozen or so that were then blasted repeatedly with grapeshot. Usually this resulted in at least one being left alive mortally wounded and screaming, forcing the soldiers to finish them off with bayonets. Terror, salutary terror, is now the order of the day here. We are causing much impure blood to flow, but it is our duty to do so, it is for humanity’s sake. The blood of criminals fertilises the soil of liberty and establishes power on sure foundations. The scope of the carnage in Lyon was enough that it even gave Robespierre pause, at least publicly. Fouché was recalled to Paris, where he found that Robespierre had replaced the Cult of Reason with the Cult of the Supreme Being. Rather than being atheistic, this religion venerated an “unknowable godhead”. Fouché publicly mocked the new Cult, a risky business as several of the most prominent architects of the Cult of Reason had been executed for the same reason. When Robespierre tried to expel Fouché from the Jacobin Club (a clear prelude to a trial and executio), Fouché realised that it was Maximilien or him. And he did not intend it to be him. Robespierre’s ruthlessness and erratic behaviour had already led several to conspire against him, and it was the protection of one of these (Paul Barras) that saved Fouché’s neck for the moment. Fouché in return worked tirelessly to marshal opposition to Robespierre. Rather than being expelled from the Jacobin Club he managed to become its President, which gave him a good platform to sound people out. Mostly people simply needed to know that others felt the same way, as otherwise everyone was afraid to stick their neck out. Once people knew that the mood was against Robespierre, his fall was almost comically swift. When it became feared that he was about to institute another purge, his ally Louis Antoine St-Just was heckled into silence while giving a speech. The hecklers denounced Robespierre as a traitor and a tyrant, and a vote condemned to arrest. He tried to escape but was captured, tried and executed. With his death, Fouché was saved. Once again, Fouché had the virtues of luck and timing. Many of his fellow representatives-on-mission wound up facing the guillotine for their role in atrocities during the Terror, but he was spared that fate due to his involvement at the heart of the Thermidorian conspiracy. He was arrested, but avoided any trial before the general amnesty that was called after those considered a real risk had been executed. He was too far to the left for the political climate, and found himself left out in the wilderness. There are some who think this was a ploy though, and that he acted as a spy for the Directorate on these groups. That would explain how he managed to land a lucrative contract to supply the army, which allowed him to build up a sizable personal fortune. It was around this time that he married a woman named Bonne-Jeanne Coiquaud, anad had the first of what would be many children. By 1799 he was considered rehabilitated enough to become Minister of Police in 1799, shortly before the next coup rearranged the fortunes of the French Revolution again. As Minister of Police Fouché was the one responsible for finally closing down the Jacobin Club, the engine of so much of the Revolution, after it fell afoul of the Directors who ruled France at the time. Officially it had been closed down five years earlier, but the Jacobin partisans hadn’t gone anywhere. The elections of 1799 saw a large number of them voted into the Assembly, where they were soon at odds with the Directorate who held supreme authority. The new Club du Manege was supposed to act as a rallying point for them, but it proved far too successful for the authorities to ignore. So Fouché broke up the club and arrested all those distributing papers critical of the government. It was clear to him that the Directorate’s days were numbered, though, and he was not a man to bother himself with ideals of loyalty. So he attached himself to the new rising power: an ambitious general named Napoleon Bonaparte. Joseph Fouche painted by Jean-Baptiste Sambat. Fouché’s service in Napoleon’s coup on 18 Brumaire was mostly a matter of non-involvement. 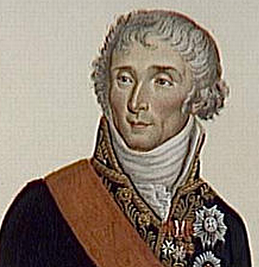 He ensured that when Napoleon’s men seized power and arrested the two Directors who refused to resign. This put him in Napoleon’s good graces, enough for him to remain on as Minister of Police. It was a trust he soon nearly betrayed, according to stories, in June of 1800. At the time Napoleon was off in Italy, and word arrived from Marengo that he was in dire straits. A conspiracy soon arose to oust the Bonapartes and take power if Napoleon was defeated. The plot was aborted when word arrived that Napoleon had won the battle, and when he returned to Paris he ordered Fouché to capture the conspirators. This was somewhat awkward for Fouché as he was allegedly the leader of the conspiracy. Luckily there was little to link him to the plot, apart from some papers in the possession of Senator Clement de Ris. 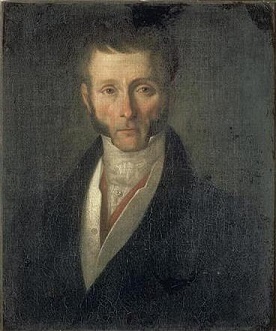 This is the motive that is said to lie behind the mysterious kidnapping of Senator de Ris in September of 1800, so that agents of Fouché could destroy the documents. Three men were later executed for the kidnapping on extremely flimsy evidence, in a scandal that forever soured Fouché in the eyes of the general public. Fouché proved his value to Napoleon in December of 1800, when his spies within the Royalists drove them to try and assassinate Napoleon. This then allowed the First Consul to crack down on the Royalists (and on the remaining Jacobins) with impunity. Fouché’s attempts to defend the Jacobins lead to a soured relationship between the two men, and he left is post as Minister in 1802. It is worse than a crime. It is a political error. Despite this comment, Fouché was once again made Minister for Police later in 1804 after Napoleon declared himself Emperor of France. There were many of the old revolutionaries who rankled at the idea of having an absolute monarch once more, but Fouché was feared enough that conspiracies were few for the first years of Napoleon’s reign. 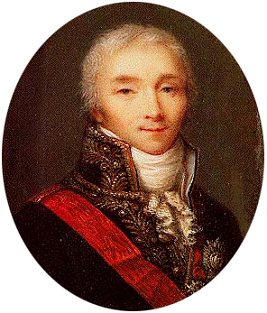 In fact the emperor was more afraid of conspiracies involving his ministers than his people – a rumour that Fouché had been meeting with Talleyrand despite a public enmity between the two was enough to make him turn back from a military campaign in Spain to investigate. He found nothing to the story, which seems to have reaffirmed his trust in Fouché – at least, for the moment. 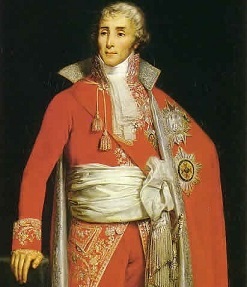 Joseph Fouché in his ducal regalia. Let us prove to Europe that although the genius of Napoleon can throw lustre on France, his presence is not necessary to enable us to repulse the enemy. The problem was that Fouché saw himself as a partner in running the country, but in Napoleon’s eyes he had no partners; only underlings. Fouché might be the most senior of those underlings, but he should remember his place. With that difference in perspective, it was inevitable that Fouché would run into trouble. At the beginning of 1810, for example, Napoleon opened negotiations with the British – only to find that Fouché had already done so on his behalf. As a result, in the summer of 1810 Fouché was once again dismissed from his post as minister and sent to govern Rome on Napoleon’s behalf. When Napoleon found out that Fouché had removed some documents from the minister’s office on leaving, Fouché made preparations to flee to America. Luckily for him Napoleon’s sister Elisa intervened on his behalf, and he was able to make peace with the emperor. Joseph Fouché as an older man. Napoleon didn’t want Fouché in France though, so he made him governor of the “Illyrian provinces” (Slovenia, Croatia, parts of Austria and other lands around that area). This was officially a great honor, and in practice a mare’s nest. Fouché did his best to bring his liberal ideals to the area and tried to dismantle the serfdom system, but wound up having to flee as the Austrian army came in and conquered it. He wound up in Naples, where he started negotiating his passage into a post-Napoleon world. The writing was on the wall, and Joseph Fouché was not a man to let loyalty drag him down. He returned to Paris in time for Napoleon’s abdication, and managed to oversee some of the transition back to royal authority – enough that he avoided prosecution for his part in the Revolution, at least for now. Fouché was frozen out of the new government, though, and so during the brief “Hundred Days” after Napoleon escaped from Elba and took over the country he became the Minister of Police under Napoleon once again. He played both sides, as always, and was in secret negotiations with the Austrians while he was securing the capital for the Emperor. After Waterloo he acted as an intermediary for those negotiations, hoping to become Prime Minister under the new regime. Talleyrand outmaneuvered him and took that job so Fouché was once again left with his Minister of Police position. This time he wasn’t just serving it under an autocratic Emperor, though – instead he was serving under a Bourbon monarch, the brother of the man he had argued for the execution of. His flexible morality put survival and holding on to power ahead of all else. An engraving of Joseph Fouche made two years after his death. Rightly or wrongly, Fouché took the blame for the reprisals against those who had supported Napoleon’s return to power. He was especially vilified for the execution of Marshall Michel Ney, a man who was considered by many one of the true French heroes. However, his time in power didn’t last long. First he was moved into the position of ambassador to Saxony, and then he found himself made a criminal. A law passed in January of 1816 granting amnesty to supporters of Napoleon specifically excluded two groups – the Bonaparte family, and those who had voted for the death sentence on Louis XVI. Fouché was forced to go into exile, and took refuge in Trieste in Italy. He died there in 1820, at the age of 61. Jerome Bonaparte, Napoleon’s younger brother, burned his private papers by his request after his death; a job that reportedly took five hours. Fouché remained a notable figure after his death, and a fake memoir was published in 1824 to try and capitalize on his infamy. His family moved to Sweden, a country well-known for recognising titles of nobility considered to be vacated in their country of origin. There his descendant Charles-Louis Fouché still holds the title. Fouché himself is still alive in the world of fiction, where he has been a villain in novels for the last century or so. A constant presence to enforce the whims of the powerful on the weak in France for twenty of the most tumultuous years in her history; it seems that the perfect opportunist has found himself one last place to hang on after death. The actual French word used, mitrailleur, is nowadays usually translated as “machine-gunner”. Of course, machine-guns did not exist at the time and it originally described a member of a musket squad trained to fire and reload in alternate rows to allow for rapid fire. So-called because it took place in the month of Thermidor (June/July) under the revolutionary calendar.